The new Renault Duster gets an all-new face with a classier looking, chrome-laden grille that connects seamlessly into the redesigned headlamp cluster and also houses the Renault logo. There’s a bigger skid plate for a more robust appearance, though the round fog lamps do remind of the ones on the current generation Duster. 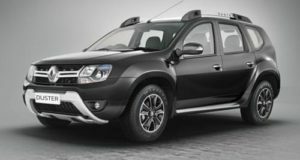 The sides look similar to the current Duster as well, particularly thanks to the wheel arches and roof rails, though the shoulder line and window sills look sportier. Wing mirrors get a new shape and look more appealing than before. The rear windscreen looks similar to the existing version’s but the new square-shaped tail lights and restyled tail gate look a lot more appealing. The tail lights in fact remind us of the Jeep Renegade, another compact SUV that’s expected to be launched in the country in the near future. The facelifted Duster also gets embossed branding atop the glovebox, but only those very familiar with the earlier Duster’s cabin will note that the layout of the centre console has been slightly revised. The buttons for the hazard lights and door lock now sit higher up and are more convenient to access. On a related note, the mirror controls that were formerly under the handbrake have been moved to the more traditional position near the window switches, which is more practical. However, the cruise control switches are still scattered between the dash and steering, and the steering column-mounted audio controllers continue to remain out of view. The cumbersome driver’s seat height adjust is also something that should have been improved. The seats themselves are trimmed in richer fabrics and the front pair get armrests for added comfort. Equipment-wise, only top-spec Duster RxZ versions see some additions. The range-topping versions finally get automatic climate control, though lower trim levels continue with the rudimentary manual setup. The functionality of the touchscreen system on the RxZ versions has also been enhanced with voice recognition for paired iPhones. There’s a new reverse camera too, as well as auto up-down for the driver’s side window. Curiously though, the Duster AMT doesn’t get a dedicated dead pedal even though the footwell is spacious enough to accommodate one. In terms of space and comfort, this Duster is no different to the pre-facelift version which is no bad thing. The front seat is comfortable and despite its flat contours, the rear seat also offers a good deal of support. There is a plenty of head, leg and shoulder room in the cabin too. As ever, the large boot will be a boon for anyone looking to use their Duster on long out-of-town excursions. The Duster always needed an automatic to get a whole new range of customers into its fold and now, it finally has one. The 1.5-litre, 4-cylinder, turbo diesel engine making 110PS of peak power and 248Nm of peak torque is mated to a six speed gearbox that then gets an AMT unit making it India’s first and only 6-speed AMT box. So does it work on a car like the Duster? Surprisingly, yes. And rather well. We first drove the compact SUV in it’s standard mode in both a sedated and an aggressive manner and came out impressed on both occasions. The gearbox does have a slight lag between gears, but on the whole, depending on how much throttle input you give it, it does seem to respond well. Like the standard car, the new Duster also gets an ECO mode. Although it might not have made sense in the manual, in auto mode, it does. The gearbox switches through gears at lower revs (3000rpm) and thus gives a much smoother drive in urban areas or in traffic jams. Most importantly, the AMT gearbox eliminates one of the biggest gripes that most Indian buyers had with the Duster, the heavy clutch. All in all, the AMT box really works well in the Duster and is possibly one of the best AMT-diesel combinations we have ever driven. As for other elements of the driving experience, there are mild improvements to the powertrain. The 110PS engine continues to impress for its good pulling power, but it does run quieter now and the ‘CMO 10’ engine electronic introduced first in the AWD Duster has reduced turbo-lag too. The AMT may have blunted a bit of the Duster’s performance but there’s enough grunt from the torquey engine and, if you flick the nicely finished gearlever to manual mode, overtaking is not a problem. In fact, ironically the AMT feels far better on the highway then it does in the city, as the tall sixth gear allows for easy cruising. The new Renault Duster is certainly an improvement over what was already a great car and the new automatic gearbox makes a lot more sense, especially with traffic getting worse in the cities. With sharp new looks, an updated interior along with a very robust mechanical package, the Duster ticks a lot of our boxes. So then, is it really ready to go up against the likes of the mighty Hyundau Creta that also gets an automatic diesel option? Stay tuned to ZigWheels.com as we find the answer this ever important question.